The bank losses increased from Rs 18,000 crore to Rs 53,000 crore in UPA years, Piyush Goyal alleged. The BJP on Wednesday attacked the Congress-led UPA government for blindly giving loans and weakening the banks due to which their losses increased from Rs 18,000 crore to Rs 53,000 crore, and said the NDA government brought transparency and forced people to repay their loans. "Swachh Bharat Mission of Prime Minister Narendra Modi is not restricted only to the cleanliness of courtyards but is also about the cleanliness in our economic system," Union Minister Piyush Goyal told a press conference here. The Bharatiya Janata Party (BJP) leader said that after assuming the office in 2014, the PM Modi government inherited an extremely fragile banking sector. "But the Prime Minister and Finance Minister Arun Jaitley took a wise decision not to bring any such white paper and they responsibly ran the government and brought sustainable solution to only strengthen the economy," Mr Goyal said. Slamming the previous United Progressive Alliance (UPA) government for giving loans without doing the fact-check of projects, Goyal said: "The UPA government started distributing loans from 2006 and the procedure went on till 2014. The bank losses increased from Rs 18,000 crore to Rs 53,000 crore in those years." "Due to blindly giving of loans overcapacity was created," he said. 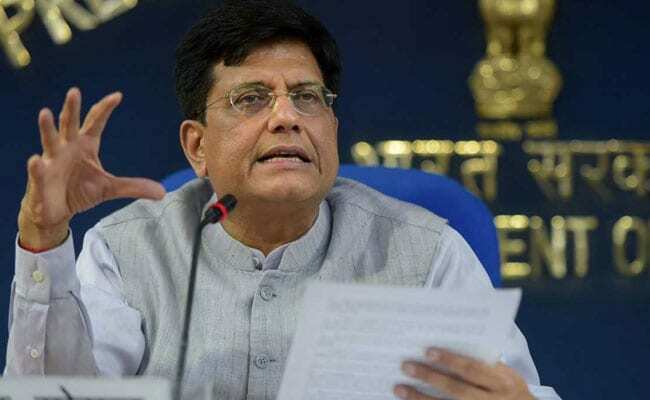 Citing example of the Indian Bank, Goyal said: "Same situation of the non-performing assets (NPAs) was prevalent when Atal Bihari Vajpayeeji's government had come to power. And at that time, he brought the transparency and the Indian Bank is running in profit." "And today, we have also brought transparency in the NPA loans and tried to resolve the entire mess that Congress gave us," he said. Attacking the Congress-led government, Mr Goyal said: "UPA blindly gave out loans and weakened the banks, but the Modi government ushered in transparency and forced all the responsible individuals to repay the loans." "In case they couldn't repay the loans, we tried to resolve through Insolvency and Bankruptcy Code," he said. The Railway and Coal Minister also said that during the UPA government, a lot of big people took loans without taking into account the responsibility that comes along with it. "But it is Modi government which has acted tough with these people and forced them to pay back," he said. Mr Goyal further said that the strictness of the government also led to the implementation of the Fugitive Law, under which the properties of the defaulters are attached. This is the first government which has taken strict action against the rich people to repay loan, he underlined. Citing the achievements of his government, Mr Goyal said: "Our government implemented the Benami Act. We brought GST instead of 40 different taxes," the BJP leader added.